Nineteen Forty-seven was the year of rock’s birth but it’d had only four months during the calendar year to make its presence known, very little, if any, hype to announce its arrival and with no national outlets for this type of music it had to simply be content to creep along the outskirts of town, moving stealthily across the country, port by port, just hoping to stir some interest and start to build a few strongholds along the way. By contrast rock ‘n’ roll in Nineteen Forty-Eight had no problems whatsoever attracting attention, for this was the Year Of The Sax Instrumental and the unholy racket they made announced rock’s arrival on the national scene with sensationalistic displays of honking, squealing and guttural squawking the likes of which would be hard to forget. If the goal of any new and untested creation is to get noticed those blowing saxophones made sure that would be the case throughout the year and among the most successful – not to mention dynamic – in that regard was Earl Bostic. You gotta love the titles of some of the honking instrumentals from the late 40’s rock scene. Having no lyrics to call attention to the tune a creative or provocative title could be more than enough to get a curious listener to deposit a nickel in the jukebox and give it a spin just to hear what organized mayhem that intriguing moniker was attached to. Hot Sauce! – Boss delivers on that goal perfectly. A title that hints of the swagger of the musician whose own name is attached to it. Of course once that record was spinning what came out of the speakers had better live up to that title or the jukebox itself might get a swift kick in the tubes for swallowing that nickel in exchange for a trite piece of fluff, so hot title or not the onus was still on the musician to deliver the goods. Bostic, as we saw his first time out with 845 Stomp, has no trouble doing that. Perhaps the most technically skilled sax player in rock’s history Bostic had gotten a music degree from Xavier University after already playing with Bennie Moten’s powerful swing band right out of high school. He then cut his teeth writing, playing and arranging for the likes of Lionel Hampton, Gene Krupa, Louis Prima, Artie Shaw… a laundry list of major names covering a wide stylistic scope. He’d been recording for years, including some on his own, and what he did on record according to most who heard him was only a small portion of what he was doing live where he was known to cut other sax legends to pieces, including reputedly even the near-mythical Charlie Parker. 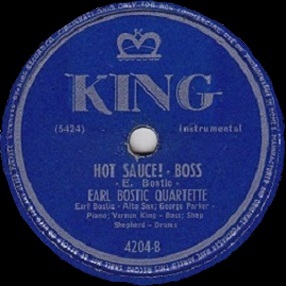 Bostic’s belief though was that putting something on record allowed other sax players to listen intently over and over until they picked it up themselves, so despite his prolific output on disc over the next decade those records were widely seen as just skimming the surface of his talents. When rock ‘n’ roll came along emphasizing flash and excitement, two things the sax clearly excelled at, it wasn’t a question of IF Bostic would join the fray but when and how much would he devote to setting the bar high within rock. This move towards commercialism however was viewed by “serious jazz musicians” (which at times can be another way of saying “musicians who view appealing to a wide audience to be a burden, precisely because they can not seem to do so”) to mean Bostic sold out. In the jazz scene of the late 1940’s as bop is taking off as the both the ultimate form of artistic experimentation and a step towards sealing jazz off from mainstream consumption, being accused of “selling out” by your peers was worse than sleeping with your best friend’s girl, stealing his wallet off the nightstand when you slipped out the back door, pawning his watch, burning down his house and then framing that friend for arson and insurance fraud as a kicker. Yet Bostic did so anyway and in some circles his reputation never recovered. Jazz critics slaughtered him for “playing for money”, other sax players, while still praising his skill, questioned his musical integrity, and even Bostic himself seemed conflicted over the need to honk and sweat to draw people in and sell records. So here we come to the first of many “art vs. commerce” internal struggles in rock’s long history. The real conflict in that view however is the fact that Bostic himself initiated the move towards the flamboyant sax style in rock to begin with. This is already his second side with that approach in three months and it’s another doozy. While it may not quite be up to the irrepressible groove of 845 Stomp, it’s certainly not far from it. Hot Sauce! – Boss is another scorcher, just the kind of music fit for the roadhouse after midnight on a Friday night. In other words, its goal is simply to be a lot of fun and in that sense it succeeds for the most part. If one wants to lay a serious criticism on Hot Sauce! – Boss it’d be that it doesn’t have much structure to it, even for a loose and manic dance record. The record starts off well enough, some stop time high pitched honking before the drums and cymbals join forces with the piano in an effort to keep pace, but from there it’s sort of unhinged. Notes pile on top of one another in cartoon-like fashion, he switches from one riff to another with little rhyme or reason, more like a collision of competing musical ideas from a schizophrenic suffering from attention deficit disorder and a hyperactive pituitary gland. Exhilarating for sure, but hardly sane or rational musically. A brief melodic interlude early on between the honking only serves to slow it down temporarily and in the ensuing changes he tosses in some familiar humorous musical quotes, sure to earn a glimmer of recognition in between the bumping and grinding on the dance floor. The rest of the time though he’s squealing up a storm, peeling paint with his legendary high notes and not letting up on the pace, making sure by the end your heart was pounding with exhaustion if you tried keeping up. It’s impressive for the sheer physicality of the performance as well as the relentless drive to keep you moving, but a bit less so as a coherent statement. It’s a little too disjointed at times for its own good. You likely won’t notice – or care – when you’re sweating up a storm with your honey, but if you happen to have a heart condition or maybe pull a muscle trying to keep up with the beat and are therefore forced to sit this one out on the sidelines and analyze it more studiously then you’ll start to see the blueprint for this structure is straight from the Dr. Suess school of architecture – fun to look at, but perilous to dwell in. Thus if you were a purist who felt he was merely slumming for attention you might be able to make your case stick a little bit better. So let’s say he DID sell out. That all along he’d have preferred to play “serious” music, or at least what was viewed as serious by other virtuosos on the instrument. Everyone agrees his technical ability was unrivaled, even those who criticize him for his stylistic choices never would question his skills. But upon closer inspection doesn’t it appear that his commercial insticts were ALSO unrivaled? Though not a charted hit this still moved enough copies to justify his decision and the best was still yet to come in that regard, as the number of records he sold from his immersion into rock as it began in 1947 through the end of the 1950’s almost certainly surpass all other sax players, with the possible exception of the high priest of honking, Big Jay McNeely. 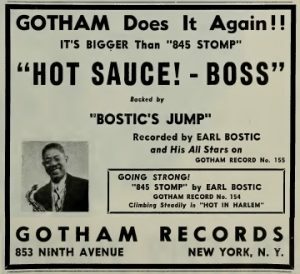 Additionally the influence that Bostic had over a major genre of music, one that would soon knock jazz even further down the hit parade, is substantial as well. He raised the bar on virtuosity for a style that might otherwise have been perfectly content to aim even lower than it was often accused of doing. Lastly, let’s not forget that because of his success with this approach he was able to tour extensively while featuring solid bands with big names backing him and he made good money doing what he loved to do. He could still play more “serious” music at the type of gigs that allowed for it (as well as doing so frequently on record) all while drawing much larger crowds than only the niche audience he may been consigned to had he stuck with a more artsy approach. I dunno, to me it seems like he did what musicians are SUPPOSED to do, mix art and commerce, and he did it better than most. Besides who is to say that jazz is MORE artistic than rock anyway? More complex and difficult maybe, but art is where you find it and should be determined largely by what appeals to an audience’s own artistic impulses, whatever they may be. Like it or not rock, far more than jazz from the late 40’s on, simply had broader appeal. Call it primitive art if you want to be snobby about it, but then again if you’re the kind of snob who thinks that you’re probably at the wrong blog to begin with. From time to time along the way here at Spontaneous Lunacy within the context of our look at rock’s evolution we’ll get a chance to comment on the surrounding musical landscape and how IT contributed to rock’s rise by their own concurrent musical and commercial moves. Jazz, for all of its brilliance (and make no mistake about it, I have the utmost respect for it), a musical style that, pound for pound, probably valued sheer technical skill more than any other, had succeeded for a long time by melding top notch musical ability with a healthy dose of mainstream appeal. But the heyday of the form, spanning the dawn of the jazz age in the 1920’s through the big band and swing era that followed, was now winding down, as almost all popular forms of music do when a new audience replaces the previous one as the main consumers of the product. Faced with declining interest for the already established but commercially fading styles, a situation exacerbated by the peripheral effects of a lengthy recording ban, the best of the up and coming jazz musicians embraced bop – a remarkably virtuosic strain of the music that was accused of valuing self-indulgence over the communal experience its predecessors had ridden to the top – and its commercial appeal never again reached the heights it had earlier. But now, right on its heels, almost made to order to fill the gap of what jazz had left behind, was a style of music that was much cruder, racier, more flamboyant and viscerally exciting to a new generation who’d come of age during a different time, embracing different aesthetics and with a different worldview who were looking for a style to speak for them and call their own. Just as jazz itself had once been said to be gaudy, cheap, crass and sensationalistic by critics in the Roaring Twenties, rock ‘n’ roll was now called the same things, yet it embraced those criticisms because they were merely giving their own audience – one that had no need for, allegiance to, or interest in jazz – what they craved. Earl Bostic could’ve gone with either camp and succeeded artistically. That he chose the camp that also let him succeed a bit more commercially has been held against him for years. But maybe it’s time the ones who chose the art over commerce road start recognizing that Bostic was creating real art in the commercial field as well. Leave a reply on "Earl Bostic: “Hot Sauce! – Boss”"